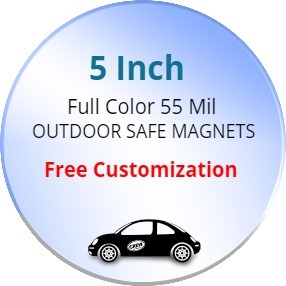 5 Inch Custom Circle Magnets - Outdoor & Car Magnets 55 Mil are ideal for the promotions of schools, organizations, sports teams and also various events. Utilize their outdoor safe properties to take your promotional impact to the outside world more effectively. Extra thickness assures better durability and strength to these custom magnets Made In USA. Order these custom circle magnets today to get free shipping in the Contiguous USA, free design and lowest price guarantee offers. Request a quote to know savings that you can pocket on bulk ordering these 5 Inch Custom Circle Magnets - Outdoor & Car Magnets 55 Mil.